Chronic Obstructive Pulmonary Disease or COPD typically affects people over age 45, especially those who smoke or have smoked, and those with risk factors associated with genetics or environmental exposures. Symptoms include chronic cough, sometimes called "smoker's cough," shortness of breath, wheezing, not being able to take a deep breath, and excess mucus produced by the lungs. 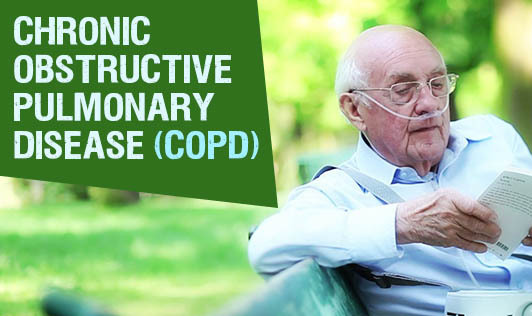 COPD is also called by other names, like emphysema or chronic bronchitis. In people who have COPD, the airways (tubes that carry air in and out of your lungs) are partially blocked, which makes it hard for the air to get in and out. COPD develops slowly and worsens over time. COPD can be diagnosed with a simple breathing test called spirometry. Quit Smoking: If you smoke, the best thing you can do to prevent more damage to your lungs is to quit. Ask your doctor about new options for quitting. Avoid Exposure to Pollutants: Try to stay away from other things that could irritate your lungs, like dust and strong fumes. Stay indoors when the outside air quality is poor. You should also stay away from places where there might be cigarette smoke. Visit Your Doctor on a Regular Basis: See your doctor regularly, even if you are feeling fine. Be sure to bring a list of all medicines you are taking, to each doctor's visit. Follow Treatment Advice: Be sure to take your medications and follow your doctor's advice on how to treat your disease. If you have any questions - ASK!